Possibly the oldest public building in Stockwell, St Andrew’s Church is a shadow of its first incarnation, a rather attractive chapel first put up in 1767. Extended in 1810 and then remodelled in the Romanesque style, it is now a grubby-looking non-descript building. St. Andrew’s church is the oldest church in Lambeth apart from the parish church of St. Mary. In 1711, a year after the establishment of Commissioners for building fifty new churches in London, Westminster and the suburbs, the inhabitants of Lambeth presented a petition to the Commissioners praying that an additional church might be built in the parish. Sir John Thorny-croft, Lord of Stockwell Manor, offered to present two acres of waste ground, and the consent of those freeholders of the Manor who enjoyed rights of common was obtained. As a result of this offer the Commissioners resolved that “the new Church intended to be built within the parish of Lambeth, ought to be erected within the Liberty of Stockwell, upon the ground offer’d gratis by Sir John Thornicroft”. For some undiscovered reason this project came to nothing and it was not until 1767 that a piece of land on the estate of the Duke of Bedford was obtained, and Stockwell Chapel erected. The cost of erecting the chapel was met by voluntary subscriptions. In 1788 the land on which the chapel was built, part of Stack Yard Field, was conveyed by Francis, fifth Duke of Bedford, to the Archbishop of Canterbury, the Bishop of Winchester and the Rector of Lambeth and their successors upon trust for use as a chapel of ease. In 1844 it was stated that the chapel could hold 800 people. It was drastically remodelled in 1867 and extended westwards by one bay so that the accommodation was increased to 1,043. A tower was also built at the southwest corner at this time and the galleries were reconstructed. The architect for these works, which cost approximately £2,500, was Henry Edward Coe. 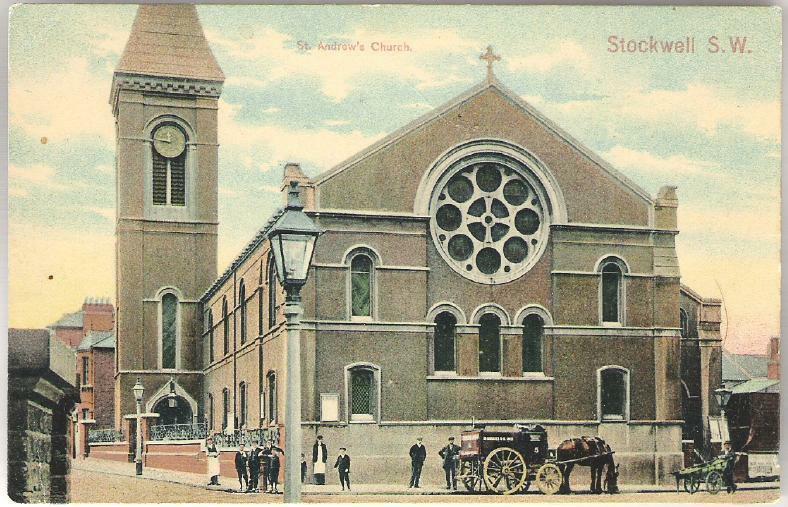 The building was opened on November 30, 1867, and consecrated on June 11, 1868, and dedicated to St. Andrew; a Consolidated Chapelry was assigned in the same year. Since then the fabric has remained in virtually the same form except that the grey brick of the exterior was rendered over in the 1880s and the side galleries were removed in 1924 when an extensive restoration was carried out. When the church was remodelled in 1867 the plain body was elaborated with detail of an Italian Romanesque derivation, and the tower or campanile was erected in a similar style. The tower, which contains the entrance, is of three stages and supports a rendered pyramidal spire which is banded horizontally and surmounted by a stone gabled finial of squat proportions. The tower and the body of the church are covered in roughcast of a grey-brown colour, with red rendering above the upper windows and to the corner piers. The caves of the tower and of the church, which has a slated roof, are corbelled, and the windows are simply detailed with stone mullions and surrounds. The large circular east window over the altar has plate tracery and at its centre is a round light, containing a St. Andrew’s cross, surrounded by eight large and eight very small lights.